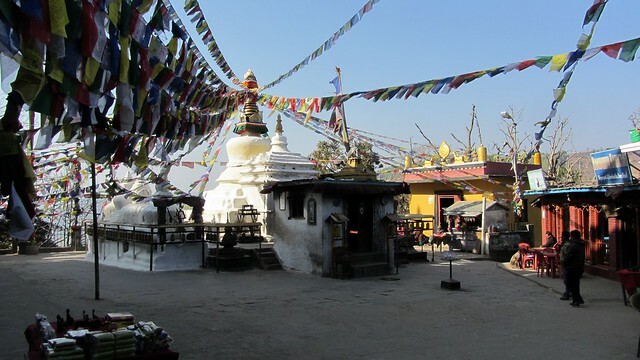 The Namo Buddha Monastery is one of the most important pilgrimage sites of Buddhists in Nepal and is also considered as one of the holiest in the world. It is located about 40km away from Kathmandu and at a height of 1759 meters. The monastery is surrounded by Tamang settlements, providing a window into the local culture. It is believed that it is the place where the Buddha, in his previous life as a prince, gave his body to a starving tigress and her cubs, thus rendering this spot holy for the Buddhist followers. There is also a cave with the statues of the prince, the tigress and the cubs on this site. This place is known by the Tibetan people as “Takmo Lu Jin”, which literally means Tigress Body Generosity. The monastery has a splendid panoramic view of the surrounding view of the mountains and thus has a very soothing atmosphere. You can come across a number of Buddhist stupas on top of the hilltops. There is a varied landscape and diversified cultures intermingled around the monastery and you will be surprised by the number of temples located within its vicinity. Namo Buddha Monastery is a pleasant and out-of-the-way place. Visit this place for the peace and tranquillity!